To lose your independence is a terrible thing. Between leaving your home, sacrificing your ability to come and go as you please and the forfeiture of privacy, moving into a nursing home or extended care facility can be stressful and dreaded. But it isn’t the only option for you or your loved one. In fact, it isn’t even the best option. Granny NANNIES provides home health care services to keep you or your loved one in their home and autonomous. Not quite sure if it’s the right decision? Let’s start the conversation by dispelling any of your preconceived notions. If you think: You have to be elderly. You should know: Granny NANNIES is available for individuals of any age or with any need. We care for terminally ill cancer patients, the bed-ridden and disabled, persons with special needs, new parents and even people who need assistance with everyday activities such as bathing, meal preparation and dressing. There is no minimum or maximum level of care you or your loved one must meet to qualify for Granny NANNIES’ services. If you think: It’s the most expensive option. You should know: The reverse is more accurate. Home care is one of the most affordable options. With home health care, the cost is computed on an hourly basis, dependent on the level of care and hours of service. Therefore, you and your loved one could be saving money by not needing around-the-clock care. Having said that, even for people who do need 24-hour assistance, nursing home rates have been steadily rising at a rate of approximately 3.6% each year. Home care providers can ultimately be less expensive. If you think: Insurance won’t cover home health care. You should know: This is the number one question we get asked. While individual plans may vary, numerous long-term care insurance policies (LTC/LTCI) do. If LTC/LTCI is not a viable option, there are other alternatives. Workers’ compensation is among the many different types of insurances that pay for home care services. If you or your loved one are unsure, we are happy to investigate patient benefits for you. If you think: The caregiver won’t be friendly. You should know: Granny NANNIES wants you or your loved one and your caregiver to get along. In fact, we start your process with a personality screening. Once we’ve nailed down the personal qualifications you or your loved one require, we identify the caregivers whose skillset and schedule are compatible and make the introduction. pass a national criminal background check, have positive references and are in good physical condition to assist you. We also require they have the kindness and compassion needed to treat you courteously and properly. You and your loved ones can trust the person coming into your home. If at any time you or your loved one are unhappy with the relationship, we can re-match you. If you think: Doctors won’t be kept in the loop. You should know: We’re happy to accommodate any specific communication preferences you or your loved one may have related to the care you or your loved one receive. In some cases, it may be necessary to consult with the primary physician(s) or medical practitioner(s), hospital, social worker(s) or nursing home involved. However, we are very respectful of your family’s privacy. We will not discuss any of your information without consent. Granny NANNIES offers home care services for individuals of any age or with any need and is available 24 hours a day, seven days a week. 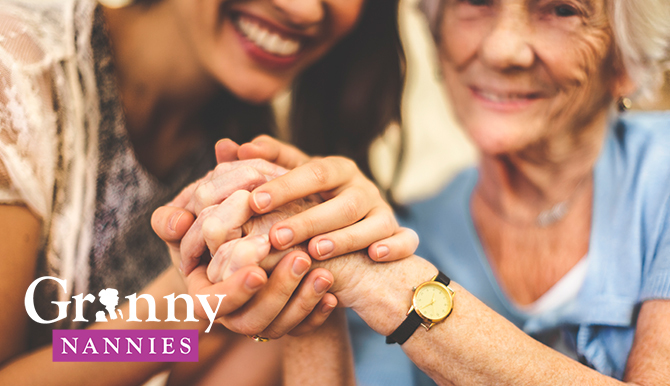 Founded in 1990, Granny NANNIES maintains a commitment to excellence and a strong dedication to treating clients with the highest level of respect and dignity. When you need quality, trustworthy, reliable and affordable senior care, Granny NANNIES is there. For more information, call 800-316-2669.